Early in the 1968 presidential campaign, in an "off the record" meeting with a group of Midwestern newspaper editors, the eventual Republican nominee Richard Nixon disclosed what came to be known as his "secret plan" to end the war in Vietnam. According to later reports, the plan provided that upon becoming president Nixon would 1) arrange a summit meeting with Soviet leaders to gain their help in ending the War and 2) seek to "de-Americanize" the conflict through "Vietnamization" by gradually shifting responsibility for the military effort to South Vietnam. In later interviews long after Nixon left office, key campaign insiders stated that in fact there was no such plan, and Nixon's hints were intended to disarm media and other commentators increasingly critical of the War. In the wake of the chaotic Democratic Convention in Chicago, Nixon had held a double-digit lead in the polls over Hubert Humphrey, but the race increasingly tightened as election day approached. Five days before the election, President Johnson announced that on the basis of developments in the ongoing informal Paris peace talks which had commenced in May 1968, he had ordered the complete cessation of “all air, naval, and artillery bombardment of North Vietnam.” The President further disclosed that North Vietnam had finally agreed to allow the South Vietnamese government to participate in the formal peace negotiations. The announcement was the "October surprise" which the Republicans had long feared that Johnson would use to boost Humphrey's chances for victory. Publicly, Nixon supported the bombing halt and the negotiations; privately, however, his campaign had previously worked for months to undermine the impact of the "surprise" by successfully urging South Vietnam's government to refuse to take part in the talks. The Nixon insiders worked through Anna Chennault, a Republican activist with ties to the South Vietnamese government, to advise Saigon that it would get better terms if Nixon won and Humphrey lost. A few days before the election, Johnson phoned Nixon about the reports, but was assured by Nixon that he had no knowledge of anyone in his campaign reaching out to the North Vietnamese (audio and transcript below). Once the election was over, Nixon said he backed Johnson's plan and favored South Vietnam taking part in the peace talks. In January 1969, five days after Nixon was inaugurated, delegates from the U.S. flew to Paris for peace negotiations with representatives of North and South Vietnam and the National Liberation Front. But the talks soon bogged down, with the North Vietnamese demanding the withdrawal of U.S. troops and the dissolution of the South Vietnamese government and the U.S. insisting that the sovereignty of South Vietnam be maintained. With no progress in Paris, the White House explored other options. Nixon instructed Henry Kissinger, his national security advisor, to begin secret talks in August 1969 with the North Vietnamese -- without informing either South Vietnam or the U.S. military allies in Vietnam. Meanwhile, as neither the Paris talks nor his secret meetings with Le Duc Tho, North Vietnam's chief negotiator and secretary of its central Communist committee, showed progress, Nixon increased military pressure on North Vietnam while also gradually drawing down U.S. troop levels, which peaked at 543,400 in April of his first year in office, as additional South Vietnamese forces were mobilized. In 1970, his attempt to slow the flow of North Vietnamese soldiers and supplies into South Vietnam by sending American forces to destroy Communist supply bases in Cambodia in violation of Cambodian neutrality provoked antiwar protests on the nation’s college campuses. 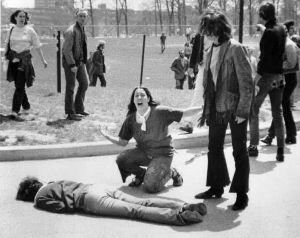 On May 4, the opposition to the war escalated further after four students were killed by soldiers of the Ohio National Guard, who had been mobilized by the governor to control demonstrations at Kent State University. In the spring of 1972, more protests and marches took place when Nixon ordered the renewal of bombing of Hanoi and Haiphong, the mining of Haiphong Harbor, naval raids against coastal installations and a blockade of the North Vietnamese coastline. In October 1972, just before Nixon's landslide re-election victory over George McGovern, Henry Kissinger announced that as a result of his protracted secret meetings with Le Duc Tho, “We believe that peace is at hand,” and that “what remains to be done can be settled in one more negotiating session with the North Vietnamese negotiators, lasting, I would think, no more than three or four days.” But the pre-election announcement proved overly optimistic; after talks broke down, Nixon ordered what became known as the Christmas Bombing of North Vietnam, which resulted in over 100,000 bombs being dropped on Hanoi and other North Vietnamese towns. Talks resumed in late January, with Kissinger and Le Duc Tho reaching a final agreement, over the objections of the South Vietnamese, providing for a cease-fire, the release of American prisoners of war, an arrangement for U.S. withdrawal, and a vague “council of national reconciliation” to resolve political issues through the supervision of elections. The U.S. finally gave up on its demand that North Vietnamese troops leave their positions in South Vietnam, a concession which key members of the American negotiating team, possibly including Kissinger himself, believed eventually would result in the fall of South Vietnam. The accords were formally signed on January 27, 1973, shortly after Nixon had been inaugurated for his second term in office. By the end of March, all U.S. troops had been withdrawn from South Vietnam. After the departure of the Americans, the North Vietnamese gradually took control of more areas of South Vietnam, which also suffered continuing internal divisions over the leadership of President Nguyen Van Thieu. President Nixon resigned in August 1974 as a result of the Watergate scandal, but his successor President Ford kept Nixon's key foreign and military policy advisers, including Secretary of State Kissinger. In March 1975, the North Vietnamese began an offensive which confronted only sporadic opposition from the South Vietnamese Army, with major units retreating without fighting or dispersing in panic. 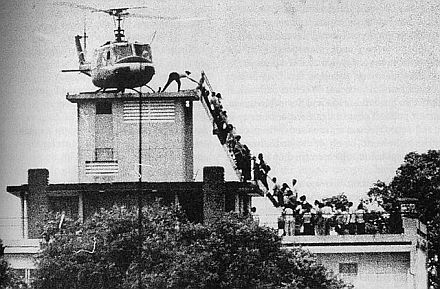 As the assault neared Saigon, American diplomats attempted unsuccessfully to negotiate with North Vietnam to allow an orderly withdrawal of the remaining U.S. civilians and military, along with South Vietnamese who had worked with or cooperated with them who might be subject to reprisals by the communists. On the morning of April 30, the first North Vietnamese forces entered the city and General Duong Van Minh, the former president who a few days before again had become president after the resignation of President Thieu, announced an unconditional surrender, declaring that the South Vietnamese government was "completely dissolved at all levels."